Canned food is prepared at home from any type of meat or fish. Depending on desire, this product can be prepared for long storage or quick eating. Homemade preserves taste qualities are not inferior to the factory defaults. They are easy to prepare, delicious and fragrant. To prepare the canned fish at home, you need to prepare a pressure cooker, a saucepan with a thick bottom and a glass jar, which you need to pre-sterilize. Cans fit just perfectly clean dishes, you must follow the recipe and carefully monitor the cooking time. The fish are thoroughly rinsed with cold water, remove head, scales and fins, cut the gills and remove the entrails. Rinse again and set aside. To prepare onions and carrots. Onions cut into thick slices, carrots to RUB on a large grater. Sauté the vegetables in vegetable oil until tender. Tomato paste diluted in two cups of water, add sea salt, black peppercorns and 2 tablespoons of 9% vinegar. To this mixture well add the processed tomatoes or tomato juice in the amount of 100 ml. Tomatoes scalded with boiling water, carefully remove the skin and cut into small pieces, you can RUB the pulp through a sieve, in this case, the initial product will be tomato seeds. In a saucepan put layers, first to pour sunflower oil, put a layer of fish on top put a layer of carrots with onions, another layer of fish, another layer of carrots and onion so until then, until it will be filled ¾ full. Then, pour the mixture of tomato paste, vinegar, spices and, not bothering to close the lid. The fish is desirable to stack in neat rows, so she won't lose its shape, and the finished product looked beautiful. If cooking in the oven, the cooking time canned food is 5-6 hours on low heat in a pressure cooker duration reduced to 2 hours. After the time is up, readiness check canned food with a knife, small bones have completely dissolved. Remove the pan and put the resulting products on the banks. Roll up the lid and put in a cool place. These cans can be stored up to 6 months. To prepare canned fish from any fish, sea, lake, river. It could be a gudgeon, perch, roach, Dace and ruffe, and so on. As long as it was small and fresh. 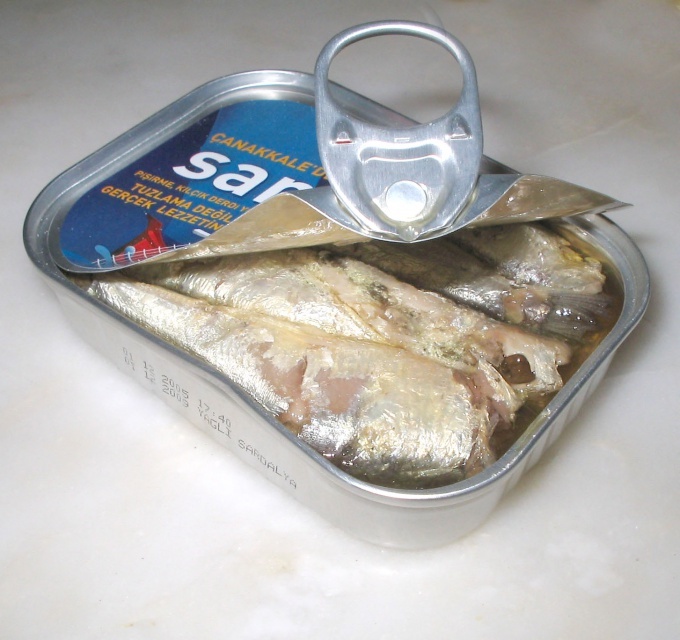 Canned fish is most convenient to cook in the oven, since there is provided the desired temperature. During cooking in any case can not interfere with the contents of the pan to avoid damaging the fish.